According to the international export-import statistics, bauxite export from Montenegro was estimated at 1.26 million tonnes in 2017. The country exports bauxite mainly to China, Czech Republic, Bosnia Herzegovina, Hong Kong, Poland, Slovakia and Serbia. 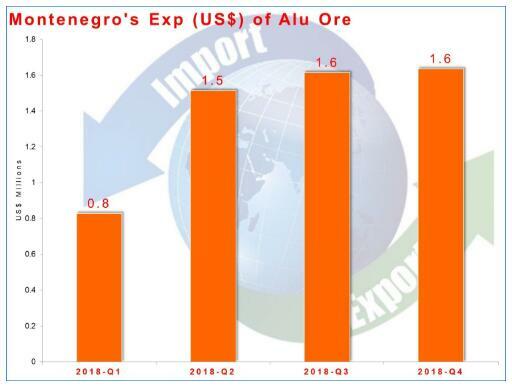 China is the largest bauxite market for Montenegro. The top aluminium producing country from Asia imported 795,560 tonnes of bauxite from Montenegro in 2017, an increase of 105 per cent from the previous year. 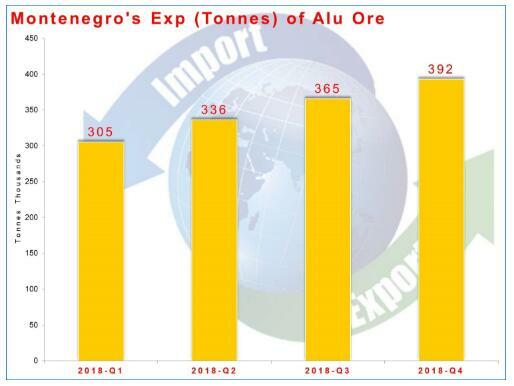 According to recent estimates, in the first quarter of 2018, Montenegro bauxite export reached an estimated total of 305325 tonnes. The revenue from the export stood at USD 0.82 million. The total bauxite export is expected to reach 336295 tonnes and 365633 tonnes in the second quarter and third quarter of 2018. The revenue from export estimated to stand at USD 1.51 million and USD 1.61 million in Q2 and Q3 respectively. In Q4, the country is estimated to export about 392825 tonnes of bauxite. The revenue from export is projected to reach USD 1.63 million.